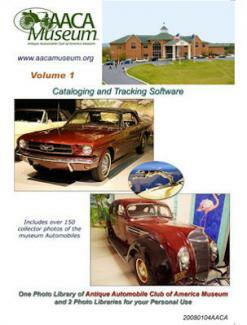 Features over 100 photos & histories of AACA Museum exhibition vehicles! Plus TWO CUSTOMIZABLE PHOTO LIBRARIES to professionally catalog photos of your car collection, car meets, die cast models, recipes, multimedia and more! An EMAIL PROGRAM to share your favorite images as you view them!Separate Internet service required. An APPOINTMENT CALENDAR & DIARYwith pre-loaded AACA Museum exhibit dates and space to expressyour thoughts on your favorite events! FIVE GREAT PROGRAMS In ONE CONVENIENT PACKAGE! Compatiable with Windows XP & Vista. Works with MAC using Parallel or Bootcamp. Windows 7 Users: Works with a Windows XP Simulator that you download from Microsoft for free. Once downloaded you can install it to Windows 7 and run it under Windows XP Mode. Need help? Click this link for support! Exchanges/Returns not accepted for opened software. *Images are the property of the AACA Museum and cannot be reproduced for commerical use, this includes posting images to forums, without the permission of the AACA Museum (not to be confused with aaca.org).